Zimbabwe election officials say that President Robert Mugabe won the presidential election with 61 percent of the vote, compared to 34 percent for challenger Morgan Tsvangirai. The official state election commission announced results Saturday in which Mugabe Mugabe's ZANU-PF party won 158 of the 210 parliament seats, giving it a two-thirds majority in the legislature that enables it to make amendments to the new constitution and existing laws. 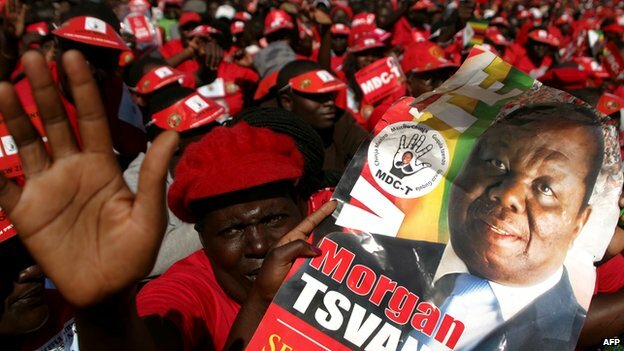 Tsvangirai rejected Mugabe's landslide victory, alleging massive voting fraud and calling for fresh elections. Tsvangirai said he will challenge the results in court. Tsvangirai told a news conference that his Movement for Democratic Change party will not "participate in any government institutions" to protest what he said was voting fraud. 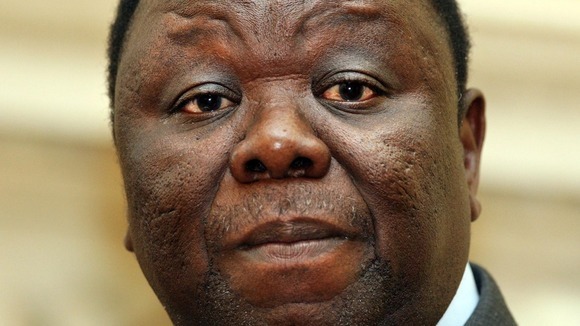 Tsvangirai called for a peaceful response, despite the alleged voting fraud. Minister of Justice Patrick Chinamasa challenged Tsvangirai to take his complaints to the courts. "If anyone is dissatisfied, the courts are there. I invite Tsvangirai to go to court if he has any grounds to justify what he has been saying," Chinamasa said on Friday. Mugabe's loyalist police set up checkpoints in Harare Saturday, apparently in preparation for any outbreak of protest demonstrations. 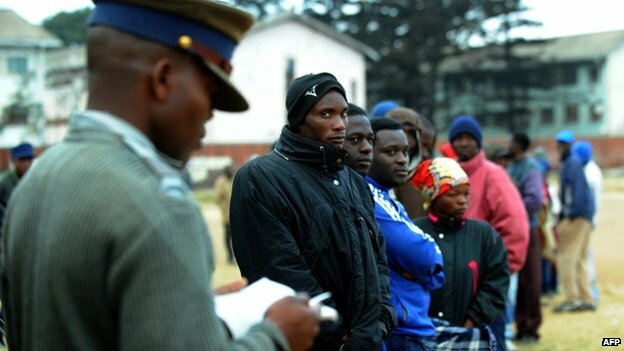 African election observers have already generally approved Zimbabwe's voting process, saying the voting was peaceful. Leaders of the continentwide African Union and the regional Southern African Development Community, or SADC, both urged the losing opposition candidates to exercise restraint over early results indicating a Mugabe lead and, however aggrieved they felt, to turn to legal channels to resolve disputes. The elections received qualified approval from the African Union, though it said it had some "grave" and "serious" concerns over polling on Wednesday. Regional monitors from southern Africa said while the vote was peaceful, it was too early to pronounce it fair. Olusegun Obasanjo, head of the African Union mission, said his monitors noted some apparent irregularities but that they did not constitute evidence of systematic tampering. 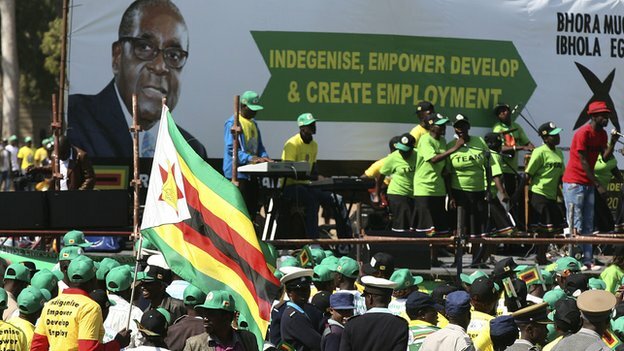 Mugabe's supporters have rejected allegations of rigging and claimed victory, raising fears of a fresh uncertainty in a country long afflicted by division and economic turmoil. The head of the observer mission for the Southern African Development Community described the election Wednesday as "very free" and "very peaceful," but noted that there were some violations and a full analysis was still under way. "The question of fairness is broad and you cannot answer it within one day," said Bernard Membe, who is also Tanzania's foreign minister. "And so be sure that within 30 days, through our main report, the question of fairness may come." 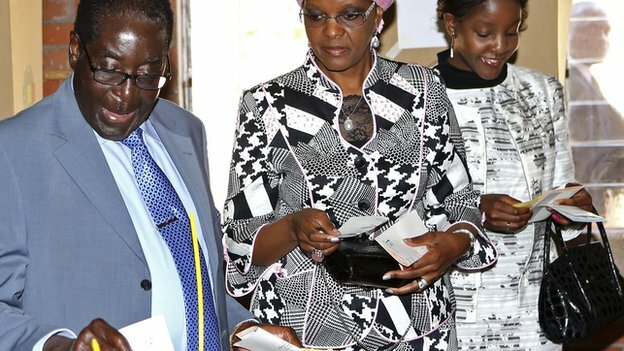 Mugabe's ZANU-PF party said poll returns showed that 3.9 million voters cast their ballots, a turnout of 61 percent, far higher than in an uncontested referendum on a new constitution in March where no disputed voters' lists were used and only national citizens' identity documents were needed. Independent election monitors have alleged many people were unable to vote because of disorganized voters' lists and a chaotic program to register electors on those lists in the run-up to polling day. Observers said a significant number of ballot booklets had missing ballot papers and papers without serial numbers. They also expressed "great concern" over the high numbers of voters turned away. The late publicity on the location of voting stations just 48 hours before stations opened contributed also to voters failing to cast ballots because they were not at correct polling sites. President Jacob Zuma, the chief regional mediator on Zimbabwe has challenged Tsvangirai to produce evidence of rigging. 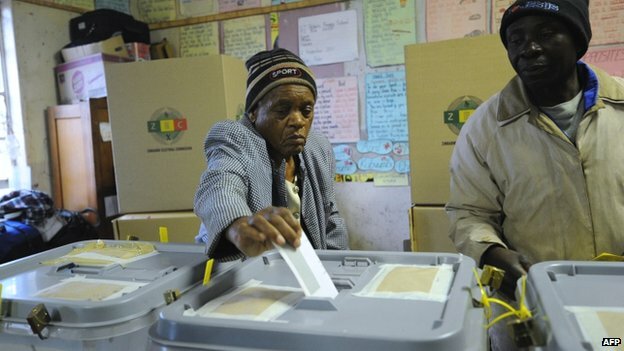 The Zimbabwe Electoral Commission (ZEC) said that Zanu-PF had won 142 seats in the 210-seat chamber. Mr Mugabe's main rival has already dismissed the election as "a sham". Prime Minister Morgan Tsvangirai, who heads the Movement for Democratic Change (MDC) and is running for president against Mr Mugabe, said the vote had been a "huge farce". African Union (AU) mission head Olusegun Obasanjo dismissed complaints of fraud, saying the election was fair and free "from the campaigning point of view". Monitors from the Southern African Development Community (SADC) described the elections as "free and peaceful" but said it was too early to call them fair. "In democracy we not only vote, not only campaign, but accept the hard facts, particularly the outcome," said SADC mission head Bernard Membe. The AU assessment sharply contrasted to that of the Zimbabwe Election Support Network (ZESN) - the largest group of domestic monitors with some 7,000 people on the ground. It said on Thursday that the elections were "seriously compromised", with as many as one million people unable to cast their ballots. The ZESN said potential voters were much more likely to be turned away from polling stations in urban areas, where support for Mr Tsvangirai is strong, than in President Mugabe's rural strongholds. The group also alleged significant irregularities before the poll. It said that 99.7% of rural voters were registered on the electoral roll in June compared with only 67.9% of urban voters. Zanu-PF and the MDC have formed an uneasy coalition government since 2009. That deal ended deadly violence that erupted after a disputed presidential poll the previous year. Mr Mugabe, 89, is running for a seventh term. His Justice Minister Patrick Chinamasa said on Friday that Zanu-PF was "headed for an unprecedented landslide". "If anyone is dissatisfied, the courts are there. I invite Tsvangirai to go to court if he has any grounds to justify what he has been saying,'' he told journalists. Under Zimbabwean law, seven days are set aside for legal challenges with another two days for rulings to be made. After that, the swearing in of a new government takes place. 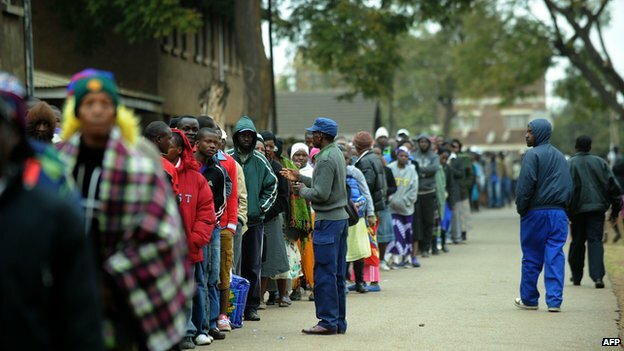 "Long queues have formed at polling stations in Zimbabwe as people vote in fiercely contested elections which have already been hit by fraud allegations. President Robert Mugabe, 89, has said he will step down after 33 years in power if he and his Zanu-PF party lose. 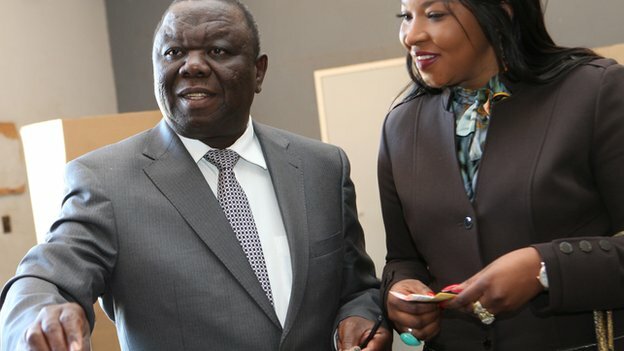 Prime Minister Morgan Tsvangirai's Movement for Democratic Change (MDC) has accused Zanu-PF of doctoring the electoral roll, a charge it has denied. Campaigning for the presidential and parliamentary poll was mostly peaceful. Zanu-PF and the MDC have shared an uneasy coalition government since 2009 under a deal brokered to end the deadly violence that erupted after a disputed presidential poll the previous year.The government has barred Western observers from monitoring Wednesday's elections, but the African Union (AU) and the Southern African Development Community (Sadc), as well as local organisations, have been accredited. Polls opened at 07:00 local time (05:00 GMT) and are due to close at 17:00 GMT. The turnout is expected to be high among the 6.4 million people registered to vote, with tens of thousands attending rallies in recent weeks. Results are due within five days. Wednesday has been declared a national holiday to ensure people can vote. 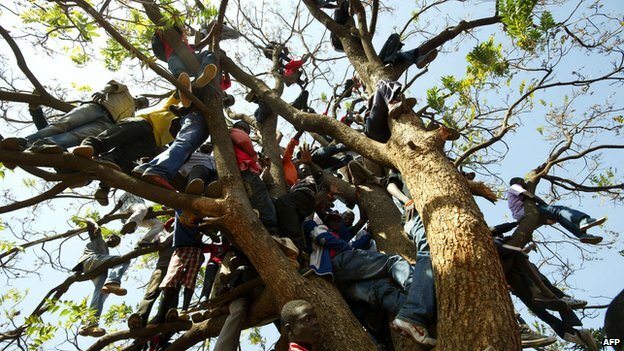 Despite this, voters queued for several hours outside polling stations before they opened, reports the BBC's Nomsa Maseko in Harare. Zimbabwe Election Support Network, the main domestic monitoring agency, said the vote appeared to be taking place without too many problems, Reuters news agency reports. "There are some concerns around long queues, but generally, it's smooth," said its spokesman Thabani Nyoni.